For other uses, see Southport (disambiguation). Southport is a large seaside town in Merseyside, England. At the 2001 census, it had a population of 90,336, making it the eleventh most populous settlement in North West England. Southport lies on the Irish Sea coast and is fringed to the north by the Ribble estuary. The town is 16.7 miles (26.9 km) north of Liverpool and 14.8 miles (23.8 km) southwest of Preston. Historically part of Lancashire, the town was founded in 1792 when William Sutton, an innkeeper from Churchtown, built a bathing house at what is now the south end of Lord Street. At that time, the area, known as South Hawes, was sparsely populated and dominated by sand dunes. At the turn of the 19th century, the area became popular with tourists due to the easy access from the nearby Leeds and Liverpool Canal. The rapid growth of Southport largely coincided with the Industrial Revolution and the Victorian era. Town attractions include Southport Pier with its Southport Pier Tramway, the second longest seaside pleasure pier in the British Isles, and Lord Street is an elegant tree-lined shopping street. Extensive sand dunes stretch for several miles from Woodvale to Birkdale, the south of the town. The Ainsdale sand dunes have been designated as a national nature reserve and a Ramsar site. Local fauna include the Natterjack toad and the Sand lizard. The town contains examples of Victorian architecture and town planning, on Lord Street and elsewhere. A particular feature of the town is the extensive tree planting. This was one of the conditions required by the Hesketh family when they made land available for development in the 19th century. Hesketh Park at the northern end of the town is named after them, having been built on land donated by Rev. Charles Hesketh. Southport today is still one of the most popular seaside resorts in the UK. It hosts various events, including an annual air show on and over the beach, the largest independent flower show in the UK (in Victoria Park) and the British Musical Fireworks Championship. The town is at the centre of England's Golf Coast and has hosted the Open Championship at the Royal Birkdale Golf Club. There have been settlements in the area now comprising Southport since the Domesday Book, and some parts of the town have names of Viking origin. The earliest recorded human activity in the region was during the Middle Stone Age, when mesolithic hunter gatherers were attracted by the abundant red deer and elk population, as well as the availability of fish, shellfish and woodland. Roman coins have been found at Halsall Moss and Crossens, although the Romans never settled southwest Lancashire. The first real evidence of an early settlement here is in the Domesday Book, in which the area is called Otergimele. The name is derived from Oddrgrimir meaning the son of Grimm and is linked to the Old Norse word melr meaning sandbank. The Domesday Book states that there were 50 huts in Otergimele, housing a population of 200. The population was scattered thinly across the region and it was at the northeast end of Otergimele (present day Crossens), where blown sand gave way to alluvial deposits from the River Ribble estuary, that a small concentration of people occurred. The alluvium provided fertile agricultural land and the river itself stocks of fish. It was here, it seems, that a primitive church was built, which gave the emerging village its name of Churchtown, the parish being North Meols (pronounced "meals", not "mells"). A church called St Cuthbert's is still at the centre of Churchtown. With a booming fishing industry, the area grew slowly and hamlets became part of the parish of North Meols. From south to north, these villages were South Hawes, Haweside, Little London, Higher Blowick, Lower Blowick, Rowe-Lane, Churchtown, Marshside, Crossens, and Banks. As well as Churchtown, there were vicarages in Crossens and Banks. Parts of the parish were almost completely surrounded by water until 1692 when Thomas Fleetwood of Bank Hall cut a channel to drain Martin Mere to the sea. From this point on, attempts at large-scale drainage of Martin Mere and other marshland continued until the 19th century, since when the water has been pumped away. This left behind a legacy of fine agricultural soil and created a booming farming industry. In the late 18th century, it was becoming fashionable for the well-to-do to relinquish inland spa towns and visit the seaside to bathe in the salt sea waters. At that time, doctors recommended bathing in the sea to help cure aches and pains. In 1792, William Sutton, the landlord of the Black Bull Inn in Churchtown (now the Hesketh Arms) and known to locals as "The Old Duke", realised the importance of the newly created canal systems across the UK and set up a bathing house in the virtually uninhabited dunes at South Hawes by the seaside just four miles (6 km) away from the newly constructed Leeds and Liverpool Canal and two miles southwest of Churchtown. When a widow from Wigan built a cottage nearby in 1797 for seasonal lodgers, Sutton quickly built a new inn on the site of the bathing house which he called the South Port Hotel, moving to live there the following season. The locals thought him mad and referred to the building as the Duke's Folly, but Sutton arranged transport links from the canal that ran through Scarisbrick, four miles from the hotel, and trade was remarkably good. The hotel survived until 1854, when it was demolished to make way for traffic at the end of Lord Street, but its presence and the impact of its founder are marked by a plaque in the vicinity, by the name of one street at the intersection, namely Duke Street, and by a hotel on Duke Street which bears the legacy name of Dukes Folly Hotel. "Municipal buildings, Southport, England", ca. 1890 - 1900. Southport grew quickly in the 19th century as it gained a reputation for being a more refined seaside resort than its neighbour-up-the-coast Blackpool. In fact Southport had a head start compared to all the other places on the Lancashire coast because it had easy access to the canal system. Other seaside bathing areas couldn't really get going until the railways were built some years later. The Leeds and Liverpool canal brought people from Liverpool, Manchester, Bolton and Wigan amongst others. By 1820 Southport had over 20,000 visitors per year. Southport Pier is a Grade II listed structure. At 3,650 feet (1,110 m), it is the second longest in Great Britain. Southport Pier is referred to as the first true "pleasure pier", being one of the earliest pier structures to be erected using iron. A design from James Brunlees was approved at a cost of £8,700 and on 4 August 1859 a large crowd witnessed the driving home of the first support pile. The opening of the pier was celebrated on 2 August 1860. Louis-Napoléon Bonaparte lived in exile on Lord Street, the main thoroughfare of Southport, between 1846 and 1848, before returning to France to become President and subsequently Emperor of the French. During his reign, he caused much of the medieval centre of Paris to be replaced with broad tree-lined boulevards, covered walkways and arcades, just like Lord Street. On the strength of this coincidence, it has been suggested that the redevelopment may have been inspired by memories of Southport's town centre. On the night of 9 December 1886, the worst lifeboat disaster in the history of the UK occurred off the shores of Southport. A cargo ship called the Mexico was on its way to South America when it found itself in difficulty. Lifeboats from Lytham, St. Annes and Southport set off to try to rescue those aboard the vessel. The crews battled against storm-force winds as they rowed towards the casualty. The entire crew from the St. Anne's boat was lost and all but two of the Southport crew were too. In all, 28 lifeboatmen lost their lives on that night, leaving many widows and fatherless children. A memorial was erected in Duke Street Cemetery and a permanent exhibition used to be on display in the Museum of the Botanic Gardens (now closed) in Churchtown. There is also a memorial inside the Lifeboat house, now operated by the Southport Offshore Rescue Trust. Mexico was just one of many shipwrecks in the Southport area. From 1894 to 1912 Birkdale and the adjoining village of Ainsdale were separate from Southport and administered by Birkdale Urban District Council before becoming part of the county borough of Southport in 1912. This was a huge expansion of the town. In 1925, the RNLI abandoned the station at Southport and left the town with no lifeboat. In the late 1980s, after a series of tragedies, local families from Southport started to raise funds and bought a new lifeboat for the town stationed at the old RNLI lifeboat house. The lifeboat, operated by the Southport Offshore Rescue Trust, is completely independent from the RNLI and receives no money from them. Instead it relies entirely on donations from the general public. On 21 March 1926, Henry Seagrave set the land speed record in his 4-litre Sunbeam Tiger Ladybird on the sands at Southport at 152.33 mph (245.15 km/h). This record lasted for just over a month, until broken by J.G. Parry-Thomas. Politically, the constituency of Southport has historically been a key battleground between the Conservatives and Liberal Democrats, but Labour has emerged as a serious contender in recent years. John Pugh was the MP for Southport, holding the seat for 16 years until his retirement in the 2017 General election when the conservatives took the seat and the Liberal Democrats candidate Sue McGuire fell into third place. The incumbent Member of Parliament is Damien Moore who holds a majority of 2914. Southport is located within the historic county boundaries of Lancashire, and was incorporated as a municipal borough in 1866. It became a county borough independent of the administrative county of Lancashire in 1915, having reached the minimum 50,000 population (the 1911 census gave a figure of 51,643). The Birkdale Urban District, including the parishes of Birkdale and Ainsdale was added to Southport in 1912. Under the 1971 Local Government White Paper, presented in February 1971, Southport would have lost its county borough status, becoming a non-metropolitan district within Lancashire. Rather than accept this fate and lose its separate education and social services departments, Southport Corporation lobbied for inclusion in the nearby planned metropolitan county of Merseyside, to join with Bootle and other units to form a district with the 250,000 required population. It was duly included in the Metropolitan Borough of Sefton. This decision has been regretted by some of the population. A recurring local political issue has been the cross-party movement campaigning for Southport to leave Sefton and form its own unitary authority, perhaps adjoined to the neighbouring West Lancashire authority. Support for this has been seen amongst Liberal Democrat councillors, and also within the Southport Conservative Party. A Southport born man Kevin Laroux Wood stood in the parliamentary election for the Southport Constituency on 9 June 1983. He was supported by a team of like minded people who raised the funds needed and formed the "Southport Back in Lancashire Party". Posters were distributed and articles published in the Visiter newspaper. Although he was not elected as MP, it put the issue firmly on the local agenda which continues to this day. In the same period in 1980, a Private Member's Bill proposed restoring Southport to Lancashire, and renaming the residue of Sefton to the Metropolitan Borough of Bootle. The Local Government Boundary Commission for England conducted a review of the area in 1987, which attracted 10,000 messages, of which "70% were pro forma". In 1990 the LGBC made suggestions that Southport, Ainsdale and Birkdale should be made a district of Lancashire: the final recommendations in 1991 "concluded that public opinion was more evenly divided than initially thought", and also that eastward transport links with Lancashire were poor compared to those southward to the Liverpool area. The government again directed the Local Government Commission for England to make a review in December 1996 (after it had finished the work on the creation of unitary authorities), commencing in January 1997. This review was constrained by the legal inability of the commission to recommend that the current Sefton-West Lancashire border be altered. In a MORI poll conducted at the behest of the LGCE, 65% of Southport residents supported the campaign, compared to 37% in the borough as a whole. Local MPs Matthew Banks and Ronnie Fearn (MPs for Southport at various times) supported making Southport a unitary authority, with Banks wishing to see it tied to Lancashire ceremonially, but Fearn wishing to see it remain, as a separate borough, in Merseyside. The commission noted that Southport would have a relatively low population for a unitary authority, even including Formby (89,300 or 114,700), and that it was worried about the viability of a south Sefton authority without Southport, and therefore recommended the status quo be kept. The commission suggested the use of area committees for the various parts of the borough and also that Southport could become a civil parish. Another request made in 2004 was turned down, the Electoral Commission must request such a review. In 2002, a local independent party calling themselves the Southport Party was established, with many members supporting a policy of "Southport out of Sefton." Three council seats were won in the 2002 local elections, including that of the leader of Sefton Council, Liberal Democrat Councillor, David Bamber. At the following election there were no gains and a drop in the number of votes for the party. At the all out election in 2004, one of their councillors stood down, whilst the other two lost their seats. To date, there have been no further moves to change Sefton's boundaries, but the Boundary Commission indicated in 2004 that a future review is possible. At 53°38′43.44″N 3°0′29.88″W﻿ / ﻿53.6454000°N 3.0083000°W﻿ / 53.6454000; -3.0083000 the town is situated in North West England. The closest cities are Preston approximately 20 kilometres (12 mi) to the north east and Liverpool approximately 27 kilometres (17 mi) to the south. Existing on the West Lancashire Coastal Plain, most of the town is only slightly above sea-level and thus parts of Southport used to be susceptible to flooding. This would be most frequently noticed on Southport's Marine Drive, which was regularly closed due to flooding from high tides. But in February 1997, new sea defences started being constructed and in 2002 the whole project was completed. Southport has a maritime climate like most of the UK. Due to its position by the coast, Southport rarely sees substantial snowfall and temperatures rarely fall below −5 °C (23 °F) so it doesn't have frequent frosts. Southport generally has moderate precipitation, unlike the rest of western UK. The coast-to-coast Trans Pennine Trail (TPT) stretches the breadth of northern England – 215 miles (345 km) from Southport in the west to Hornsea in the east. The TPT is an exciting route for walkers, cyclists and horse riders linking the North and Irish seas and passing through the Pennines. Its route takes you alongside rivers and canals and through some of the most historic towns and cities in the North of England. You can follow historic railways and canals and follow in the footsteps of packhorse traders on ancient salt routes. 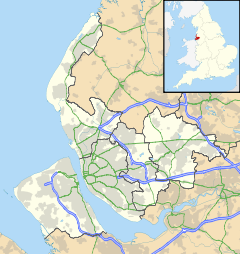 The United Kingdom Census 2001 showed a total resident population for Southport of 90,336. Approximately 19,000 were aged 16 or under, 60,000 were aged 16–74, and 10,000 aged 75 and over. According to the 2001 census, 96% of Southport's population claim they have been born in the UK. Historically the population of Southport began to rapidly increase during the Industrial Revolution and the Victorian era. From then the population has been stable with minor decline in some areas of the town. Southport is quite affluent compared with other parts of the north west. People from Southport are known as "Sandgrounders", although there is debate about what is sufficient to qualify for that name. As a seaside town Southport has a long history of leisure and recreation and is still heavily dependent on tourism. The town went into decline when cheap air travel arrived in the 1960s and people chose to holiday abroad due to competitive prices and more reliable weather. However, the town kept afloat with people coming to spend the day by the seaside on bank holidays and weekends. The town has diversified with annual events, shopping and conferences. In 2011 Southport was named the 14th most popular coastal resort in the country, benefiting from a 23% rise in money spent in the resort in that year. Part of the resort's progress is a result of the money invested in Southport over recent years. Southport 24 Hour Race A Sailing race that sees boats racing continuously for 24 Hours even in extreme weather conditions. Entries have included Olympic gold medalists and teams from Eire, France and even the USA and Australia. It is regarded as one of the hardest endurance races in the world. While Southport has a dependence on tourism the town is also home to many businesses both in the private and public sector. Some manufacturing facilities were situated in the town, most notably Chewits were manufactured in the town from 1965 to 2006, only closing to move production to Slovakia. Manufacturing has diminished in the last few decades and only a few sites are still in production in the town today. Lord Street is the main shopping street of Southport. It is one of the great shopping streets of Northern England and is said to be the inspiration for the tree-lined boulevards of Paris. In the 2000s Chapel Street was pedestrianised and is home to some of the UK's most famous brands. Southport also has a newly renovated indoor market situated on King Street and Market Street as well as a farmers' market held on the last Thursday of every month on Chapel Street. Southport is used for conferences at the Southport Theatre & Convention Centre. It has hosted the United Kingdom Independence Party national conference as well as the regional Labour Party conference. The Liberal Democrats held their federal Spring conference here in March 2018. Southport is often called England's Golfing Capital because it is at the centre of England's Golf Coast and has the UK's highest concentration of championship links courses. Royal Birkdale Golf Club is one of the clubs in the Open Championship rotation for both men and women. The club has hosted the men's championship ten times since 1954, most recently in July 2017, and has hosted the women's tournament five times, including 2010. Southport's other courses include the 9-hole Southport Old Links in High Park, the Hesketh Golf Club, Hillside Golf Club and Southport and Ainsdale Golf Club. One of Southport's main attractions for many years was Pleasureland, a fairground established in 1912. It was owned by the Thompson Family, and was closed in September 2006. A replacement fairground on the same site, provisionally named New Pleasureland, opened in July 2007. An earlier permanent funfair, Peter Pan's Playground, closed in the 1980s and is now the site of part of the Ocean Plaza shopping development. A former landmark of Pleasureland was the Looping Star roller coaster, which was on site from 1985 to 1987. It featured in the video for the pop single Wonderful Life, by Liverpool band Black, which was also shot at other parts of the Sefton and North West coastline. On 24 April 2009 a serious fire occurred at the oldest attraction within New Pleasureland. Called The River Caves, it was completely destroyed in this arson attack, and a 16-year-old boy was arrested in connection with the fire. Southport Model Railway Village is situated in Kings Gardens opposite the Royal Clifton Hotel and near the Marine Lake Bridge. The Model Railway Village opened in May 1996 and was created by Ray and Jean Jones. The Jones family still run the attraction today. The Model Railway Village season extends from April to the end of October. The season has extended into weekend openings during November, February and March, weather permitting. An earlier model village, the Land of the Little People, was demolished in the late 1980s to make way for the aborted Winter Gardens/SIBEC shopping development. Its site is now occupied by a Morrison's supermarket. Meols Hall, a manor house, home of the Hesketh family is open to the public for a limited period each year. Set in its own expansive grounds, it boasts a history back to the Domesday Book and is full of interesting pictures and furniture. Southport also boasts one of the few lawnmower museums. The Power Station, that was the base of the town's former radio station Dune FM, on the edge of Victoria Park, which itself is home to the Southport Flower Show. Rosefield Hall, one of Southport's Victorian mansions, while being restored in 2007. Queen Victoria Statue – originally moved from the Town Hall Gardens to Neville Street junction to the Promenade and again to the pedestrianised side of Neville Street. Due to its position by the coast, Southport is a linear settlement and as such can only be approached in a limited number of directions by road. A565 (from Liverpool and Formby to the south). An east-west bypass for the A570 at Ormskirk is planned to relieve congestion on Southport's main access route to the motorway network, although the effectiveness of the proposals are still under debate. Several areas within Southport town centre have recently undergone major road redevelopment; the largest scheme was the construction of the Marine Way Bridge (opened May 2004), which connects the Lord Street shopping district with the new seafront developments. The 150-foot (46 m) high structure is thought to have cost in the region of £5 million. Also one of the main shopping areas in the town, Chapel Street, has undergone a pedestrianisation scheme to be similar to parts of Liverpool city centre. Due to the limited number of directions by road, many of the services operated in Southport are from one place South to one place North or East of Southport. The main operator is Arriva North West, that operates two (previously four) services to Liverpool, and two to Wigan and Skelmersdale via Ormskirk, Scarisbrick and Burscough. Arriva also operate 5 regular, local services and one seasonal service (serving Pontins to the South of the town). There are three Park and Ride facilities - one of which is operated regularly,by Arriva, one by Cumfybus and one completely disused. Cumfybus operate two regular, local services and one dedicated Park and Ride route. Southport railway station has a frequent service of trains to Liverpool, operated by Merseyrail and a regular service to Wigan, Bolton, Manchester and Leeds. In addition, there are stations at Birkdale, Hillside and Ainsdale on the Liverpool line, part of the Merseyrail network, and at Meols Cop on the Manchester line. The Liverpool line was originally built by the Liverpool, Crosby and Southport Railway in 1848, to a terminus at Eastbank Street. It was followed on 9 April 1855 by the Manchester and Southport Railway with a line to Manchester via Wigan, with stations at St Luke's and Blowick. From 1882, the West Lancashire Railway operated from Southport Derby Road station (also known as Southport Central) to Preston Fishergate Hill. It had stations in Southport at Ash Street, St Luke's, Hesketh Park, Churchtown and Crossens. This line was shut in 1964, and nowadays, Southport and Preston are linked only by the (largely dual-carriageway) A565 and A59 roads. In 1884, another line from Southport to Liverpool was opened:- the Cheshire Lines Committee's Southport & Cheshire Lines Extension Railway extended the CLC's North Liverpool Extension Line from Liverpool Central to Southport Lord Street. It had stations in Southport at Birkdale Palace and Ainsdale Beach. The West Lancashire Railway sponsored the Liverpool, Southport and Preston Junction Railway to provide a connection to the CLC line, joining it at Altcar and Hillhouse. It had stations in Southport at Butts Lane and Kew Gardens. These lines ultimately proved uncompetitive, and the Southport services were withdrawn in 1952. In July 1897, both the West Lancashire and the Liverpool, Southport and Preston Junction Railways were absorbed into the Lancashire and Yorkshire Railway (L&Y). The L&Y had a large terminus at Southport Chapel Street and could see no sense in operating two termini at very close proximity. In 1901, the L&Y completed a remodelling of the approach lines to Central to allow trains to divert onto the Manchester to Southport line and into Southport Chapel Street Station. Southport Central was closed to passengers and it became a goods depot eventually amalgamating with Chapel Street depot. It survived intact well into the 1970s. On Southport Pier can be found the now closed Southport Pier Tramway which used to transport passengers from the Promenade to the pier head over 3,600 feet (1,100 m) on a 3 ft 6 in (1,067 mm) gauge. This closed in 2016 because of the effect on the pier of the weight of the trams. The Lakeside Miniature Railway passes under the pier, carrying passengers along the western side of the marine lake. The line claims to be the oldest continuously running 15 in (381 mm) gauge railway in the world. The town possesses a variety of academic institutions. The all-girls Greenbank High School is situated next to the Royal Birkdale Golf Club, and is a certified Specialist Language school. World-famous actress Miranda Richardson was educated at the school. The male equivalent (also situated in Birkdale) is the all-boys Birkdale High School, which specialises in Mathematics. Meols Cop High School is situated in the Blowick area of Southport and is one of the six schools in the country chosen to be written about in OfSTED's School Inspections handbook of 2012. Meols Cop High School has recently become one of the highest achieving schools in Sefton, with 96% of the students obtaining at least 5 GCSE's at A*-C grades. The school is oversubscribed and, in February 2016, underwent building work to expand the school for the increasing number of students. The school is a specialist school in sports. There are several other high schools in the town, including Stanley High School, which is a specialist sports school (whose former students include comedian Lee Mack and world-famous chef Marcus Wareing), and Christ the King. The town's last remaining independent preparatory school, Sunnymede School, which was in Westcliffe Road, Birkdale closed in 2010 due to a lack of pupils. In the past the town had more independent schools which included Tower Dene, which was situated on Cambridge Road. This school closed in 2002 due to a similar fate. One of the Victorian houses that housed the school has since been turned into apartments, the other is now a nursery. Kingswood College (originally St Wyburn's) is now housed outside Southport at Scarisbrick Hall, but it takes many pupils from the town. Brighthelmston School (girls) and University School (boys) are long closed. The town has two further education colleges: Southport College, situated near to the town centre, and King George V College (KGV), located on Scarisbrick New Road in the Blowick area of the town. Southport College offers a wide range of subjects and courses that are available to meet a range of students with different abilities but does not offer the same wide range of A-Level courses it initially did when it first opened as Southport Technical College. Courses at the college include Diplomas, NVQs, BTECs and Access courses. In addition, Southport College offers some higher education courses in conjunction with the University of Central Lancashire, Edge Hill University and Liverpool John Moores University. King George V College offers both A-Level and Business And Technology Education Council (BTEC). It originally opened as King George V Sixth Form College in 1979, and replaced the former King George V Grammar School for Boys, which occupied the same site from 1926 until its demolition in stages during the 1980s as the college was fully opened. In 2013, the college was the best performing state-funded college in an 18-mile radius of KGV. However, by 2015 Ofsted reported that it 'Requires improvement'. In 2016, Ofsted again rated it poorly, and a government report suggesting merging it with nearby Southport College. In the wake of the report, the college's principal left. The number of pupils at the college had plummeted from 1,530 in 2012 to just 652 in 2016. The college has somewhat recovered since then, with more positive results and a higher intake. Haig Avenue, home of Southport F.C. Southport is home to Southport F.C. who have played at the Haig Avenue, Blowick ground since 1905. The club entered The Football League in 1921 and became a founder member of the Third Division North. In 1978 the club was voted out of the Football League following three consecutive 23rd (out of 24) placed finishes, and was replaced by Wigan Athletic. Southport were the last club to leave the Football League through the re-election process. Automatic relegation from the Fourth Division was introduced in 1986–87. They are in the National League North, the sixth tier of English football.They were previously in the National League after winning the Conference North in 2009-10 campaign. Southport is also home to a rugby union team, Southport Rugby Football Club, who play at the Recreational Ground on Waterloo Road, Birkdale. The junior section of Southport RFC is known as the Southport Sharks, which has sides that range from 6 years old upwards. They also play on the same grounds, and train every Sunday 10 am – 12 noon. The town is probably best known for golf; the Royal Birkdale Golf Club situated in the dunes to the south of the town is one of the venues on The Open Championship rotation and has hosted two Ryder Cups. Nearby Southport and Ainsdale Golf Club is also a two time Ryder Cup venue and both Hillside Golf Club and Hesketh Golf Club host many major events as well as being final open qualifying courses. Many smaller links courses also surround the town. Southport's location by the coast also lends itself to some more specialised sporting activities – Ainsdale Beach, south of the town, is popular for kite sports, including kite-surfing. In 1925, Henry Segrave set a world land speed record of 152.33 mph (245.15 km/h) on the beach, driving a Sunbeam Tiger. His association is commemorated by the name of a public house on Lord Street. Marine Lake lies nestled between the town centre and the sea and is used for a variety of water-sports including water-skiing, sailing and rowing. The lake is home to the West Lancashire Yacht Club and Southport Sailing Club, both of which organise dinghy racing. The annual Southport 24 Hour Race, organised by the West Lancashire Yacht Club, is an endurance race of national standing, with an average turnout of 60 to 80 boats. In 2006, the event marked its 40th anniversary. The flat and scenic route alongside the beach is very popular with cyclists, and is the start of the Trans Pennine Trail, a cycle route running across the north of the country to Selby in North Yorkshire, through Hull and on to Hornsea on the east coast. In June 2008, Cycling England announced Southport as one of the 11 new cycling towns. These 11 towns shared £47 million from the government to be spent solely on cycling schemes in the towns. Southport's Cycling Towns programme aims to encourage tourism and leisure cycling, create regeneration opportunities and significantly increase cycling to school. There are now many cycle lanes in Southport and more are planned, to encourage cycling in the town. Red Rum, record-breaking racehorse and 3-time winner of the Aintree Grand National. The town's media consists of two rival newspaper groups, and two radio stations. The independently owned 'Champion' newspaper is a free weekly paper (part of Trinity Mirror's 'Sefton & West Lancs Media Mix' titles), while The Mid-week Visiter and The Southport Visiter are free and paid-for newspapers respectively. The town also falls within the circulation areas of three regional hard copy newspapers; The Liverpool Echo, The Liverpool Daily Post and The Lancashire Evening Post. Southport is also covered by several local and regional magazines, like Lancashire Life. The local Ranger Service, which is part of Sefton MBC, runs a quarterly free magazine called Coastlines. Old Southport newspapers now out of print are as follows: Independent 1861–1920s; Liverpool & Southport News 1861–1872; Southport News (West Lancs) 1881–1885; Southport Standard 1885–1899; Southport Guardian 1882–1953; Southport Journal 1904–1932; Southport Star; Southport Advertiser. The area also has many online media sites, including the UK's first online newspaper, the Southport Reporter, as well as Internet forums and blog sites. The town's commercial radio station Dune FM closed during August 2012. On a regional level Southport is covered by several local and regional radio stations, including Radio City 96.7, City Talk 105.9, Magic 1548, 97.4 Rock FM, Magic 999 and BBC Radio Merseyside. Sandgrounder Radio, a dedicated DAB radio station, which launched on Saturday 11 June 2016 now serves the town. Southport is situated within the television regions of BBC North West and ITV's Granada Television. ^ "How do you define a true Sandgrounder?". Southport Visiter. Retrieved 27 March 2016. ^ Neighbourhood Statistics. "Check Browser Settings". Neighbourhood.statistics.gov.uk. Retrieved 12 March 2015. ^ "Longest Piers in the British Isles". National Piers Society. Archived from the original on 9 April 2008. Retrieved 12 April 2008. ^ "Sefton Coast". JNCC. Retrieved 29 November 2015. ^ "Unitary Authority: Sefton, Site Name: Sefton Coast" (PDF). Natural England. Retrieved 29 November 2015. Chisholm, Hugh, ed. (1911). "Southport" . Encyclopædia Britannica. 25 (11th ed.). Cambridge University Press. p. 515. ^ "Southport Air Show Official". Sefton Council. Retrieved 1 August 2006. ^ "Welcome to". Englands Golf Coast. Retrieved 12 March 2015. ^ "87 III Roman Coin Hoards" (PDF). Lancaster University. Retrieved 29 November 2015. ^ "Lancashire OnLine Parish Clerk Project – Parish of North Meols". Lan-opc.org.uk. Retrieved 12 March 2015. ^ "Tarleton – Rev Bulpit". Heskethbank.com. Retrieved 12 March 2015. ^ "Southport by historian Alan Taylor part1". YouTube. Retrieved 12 March 2015. ^ "English Seaside Piers – Southport Pier". Theheritagetrail.co.uk. Archived from the original on 27 April 2015. Retrieved 12 March 2015. ^ "Mersey Reporter & Southport Reporter – News page". southportreporter.com. ^ Nevin, Charles (21 August 2004). "Ooh La Lancashire". The Guardian. London. Retrieved 13 December 2007. ^ "Southport Lifeboat – Welcome – Southport Offshore Rescue Trust – Southport Lifeboats – Southport Search and Rescue". southport-lifeboat.co.uk. ^ Parliamentary Debates (Hansard). House of Commons. 6 July 1972. col. 878. ^ "Meols Liberal Democrats". SouthportLibdems. Archived from the original on 5 February 2007. "In this section". Southport Conservative Party. Archived from the original on 27 September 2009. "People". Conservative Party. Archived from the original on 22 November 2006. ^ Paul Wisse, Sefton Council. "Home page – Sefton Coast Partnership". seftoncoast.org.uk. ^ "Southport (Westminster Parliamentary Constituency) – Key Figures for 2001 Census: Census Area Statistics". Neighbourhood Statistics. Office for National Statistics. Retrieved 5 June 2015. ^ "Southport (Westminster Parliamentary Constituency) – Age, 2001 (UV04)". Neighbourhood Statistics. Office for National Statistics. Retrieved 5 June 2015. ^ Cowell, Alan (12 April 2007). "Postcard From Ailing British Coasts: Wish You Were Here". The New York Times. ^ "Local and community news, opinion, video & pictures – Visiter". Southportvisiter.co.uk. Retrieved 12 March 2015. ^ "Southport Air Show – Show / Display in Southport, Southport – Southport". Visitsouthport.com. Retrieved 12 March 2015. ^ "Welcome". southportflowershow.co.uk. Archived from the original on 1 November 2012. ^ Post by The British Musical Fireworks Championship. "British Musical Fireworks Championship – Show / Display in Southport, Southport – Southport". Visitsouthport.com. Retrieved 12 March 2015. ^ "Contact Us". The Southport International Jazz Festival. Archived from the original on 28 March 2012. ^ "Southport Food and Drink Festival – Festival in Southport, Southport – Southport". Visitsouthport.com. Retrieved 12 March 2015. ^ Southport CAMRA. "Beer Festival". Archived from the original on 15 September 2008. ^ "Southport Weekender". Southport Weekender. Retrieved 12 March 2015. ^ "Southport Rocks Music Festival". Southportrocks.co.uk. 9 July 2011. Retrieved 12 March 2015. ^ [wlyc.org.uk/24-hour-race "WLYC website"] Check |url= value (help). ^ "Are you ready for the next chapter in clubbing holidays?". Ideal Weekender. Archived from the original on 23 April 2013. ^ "Southport Shopping, Shopping in Southport". VisitSouthport.com. Retrieved 12 March 2015. ^ "Southport Indoor Market, a Market in Southport, Merseyside. Search for Merseyside Markets". information-britain.co.uk. ^ "Southport Market". Retrieved 24 July 2012. ^ "Farmers' Markets". ICEP. Archived from the original on 28 March 2012. ^ "The Southport Theatre and Convention Centre". Southport Theatre & Convention Centre. Retrieved 29 November 2015. ^ "Golf in Southport". Visit Southport. Retrieved 29 November 2015. ^ "Royal Birkdale Golf Club". Visit Southport. Retrieved 29 November 2015. ^ "New Pleasureland". ukrides.info. Archived from the original on 10 November 2015. Retrieved 29 November 2015. ^ "Southport & Mersey Reporter... PCBT Photography, Online Newspapers". southportreporter.com. ^ Wonderful Life. YouTube. 21 March 2006. ^ "newpleasureland.co.uk". newpleasureland.co.uk. Archived from the original on 29 September 2009. Retrieved 30 March 2009. ^ "New Pleasureland". Archived from the original on 29 September 2009. Retrieved 30 March 2009. ^ "Southport Model Railway Village". southportmodelrailwayvillage.co.uk. ^ "Splash World Southport – Indoor all weather water park". Splash World Southport. ^ The Meols Hall Website. ^ Simon Britstone. "British Lawnmower Museum". lawnmowerworld.co.uk. ^ "Emmanuel Church – The Organs". emmanuelsouthport.org.uk. ^ "GENUKI: Emmanuel Church of England, Southport, Lancashire genealogy". genuki.org.uk. ^ "News: Bypass Boost For Ormskirk". lancashire.gov.uk. Archived from the original on 29 June 2017. Retrieved 14 March 2006. ^ "Championline - Newsdesk". 19 May 2004. Archived from the original on 19 May 2004. Retrieved 9 June 2018. ^ Lally, Kate (24 March 2016). "Southport Pier tram removed before being sold". Retrieved 10 September 2016. ^ Claim repeated here in a local tourism website. ^ "Greenbank High School". greenbank.sefton.sch.uk. ^ "Birkdale High School". birkdalehigh.co.uk. ^ "Stanley High School : Aspire – Challenge – Excel". stanley.sefton.sch.uk. ^ ICT Department – Patrick Logan <Developer>, Ivor Wood <Designer>. "Home Page". southport-college.ac.uk. ^ "Welcome page". kgv.ac.uk. Archived from the original on 4 December 2008. ^ "Local Authority : Sefton". Department for Education. Archived from the original on 23 January 2013. ^ enquiries@ofsted.gov.uk, Ofsted Communications Team. (5 November 2010). "Find an inspection report". reports.ofsted.gov.uk. Archived from the original on 12 June 2018. Retrieved 9 June 2018. ^ Duffy, Tom (5 January 2016). "Southport's KGV college receives another poor Ofsted report". Retrieved 9 June 2018. ^ "Southport Rugby Football Club". Pitchero. ^ "Cycling England". dft.gov.uk. Archived from the original on 3 October 2009. ^ "Southport Reporter – News". southportreporter.com. ^ a b c d Federation of Family History Societies. Local Newspapers. ISBN 0-907099-46-7. ^ "Sandgrounder Radio". Retrieved 9 June 2018. Wikimedia Commons has media related to Southport. Wikivoyage has a travel guide for Southport.